If you have any children in your home, you probably have a Slinky at home too. And if your kids are like most kids, that Slinky is in no shape to be doing much of anything except sitting in the closet gathering dust. Now there’s a something you can do with that stretched out toy that can provide many more years of enjoyment. If you have any cats, they will also thank you for making one of these! 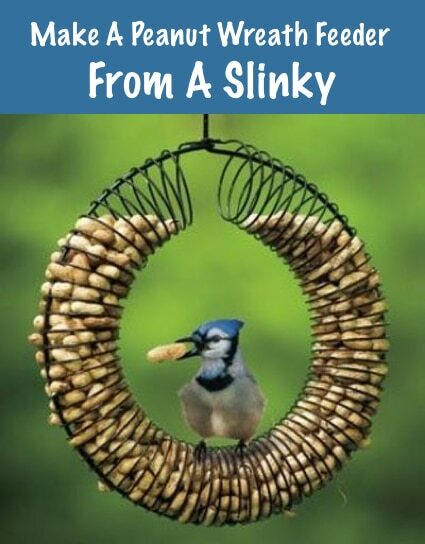 With just that Slinky, a metal coat hanger, and a pair of pliers, you can create a great bird feeder. Check out Birds & Blooms and see their easy instructions to create this fantastic peanut wreath bird feeder. You can paint the whole thing if you want it to match your other outdoor decor. Need a Slinky? Pop on over to Amazon to get one shipped to your door.